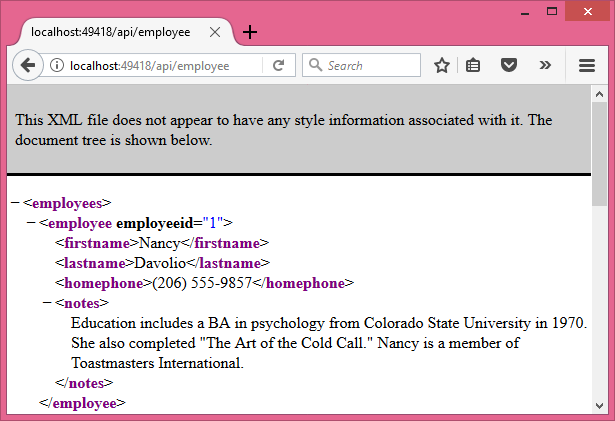 Recently I stumbled upon a situation where a large number of XML documents needed to be returned from ASP.NET Web API. This sounds like a straightforward task but there was a small twist to the story. The XML documents existed as physical disk files. The Web API should read these files. process them in some way and then convert the XML data into JSON. This was needed because the client applications were designed to handle only JSON format. Here I discuss a quick way to accomplish this task. The XML data is assumed to be residing in Employees.xml file. In order to send this data to the client we need to load the XML document. This requires physical path of the XML file. Notice the use of HostingEnvironment class from System.Web.Hosting namespace and its MapPath() method. from Colorado State University in 1970. 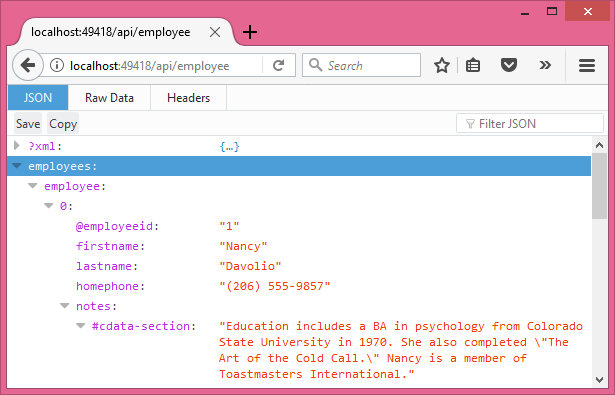 In order to return this XML data we wrap it inside HttpResponseMessage object. Notice that the return type of the Get() is also HttpResponseMessage. The CreateResponse() method creates an HttpResponseMessage object with the status code of OK. Further, we add Content to it using a StringContent object. The StringContent gets the XML data through the OuterXml property of the XmlDocument and we also specify the content type as application/xml. The HttpResponseMessage object is then returned to the caller. So far so good. But now we want to return the XML documents as JSON. How do we do that? Luckily Json.Net component comes to our rescue. It provides methods to serialize and deserialize data between XML and JSON formats. Here, we need to convert XML to JSON. So, let's see how that can be done. 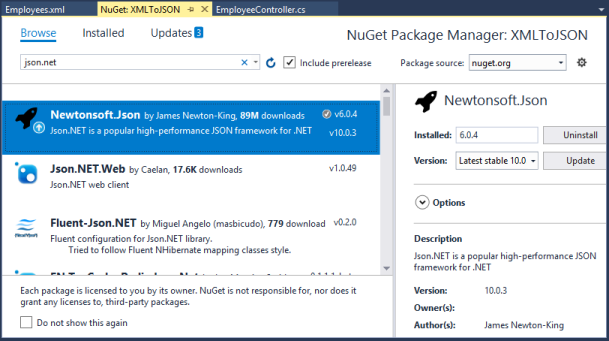 Make sure to add NuGet package for Json.Net component (if it's not already added to the project). The code looks quite similar to the earlier one. But notice the line marked in bold letters. The SerializeXmlNode() method accepts an XmlNode object and returns its JSON equivalent. While creating the StringContent we add this JSON string and set the content type to application/json. The counterpart of SerializeXmlNode() is DeserializeXmlNode() and it does exactly opposite - takes JSON data and converts it into XML document.